Why do underdogs triumph over mightier enemies? How does one turn a weakness into a strength? In yet another entertaining trip of the intellect, Malcolm Gladwell’s latest volume “David and Goliath” tackles perennial paradoxes with much aplomb. 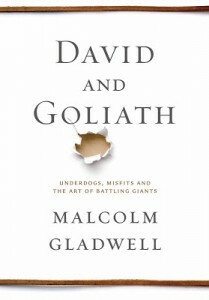 Written in his usual captivating prose, Gladwell’s book – subtitled Underdogs, Misfits and the Art of Battling Giants – provides one with much food for thought while challenging conventional wisdom. Painting vivid portraits of heroes and heroines who succeeded against the odds, Gladwell spins engaging yarns that holds you spellbound for hours. To understand the context behind his book, do spend 15 minutes watching this whimsical TED talk featuring the “untold story of David and Goliath” by the man himself. In part one of the book – The Advantages of Disadvantages (and the Disadvantages of Advantages) – Gladwell purports that underdogs should not play by the usual conventions of the game. In the story of Vivek Ranadive – an Indian-born Silicon Valley geek tasked to coach his daughter’s basketball team – we’re taught how his focus on aggressive defensive play (as opposed to shooting balls into hoops) helped his geeky girls win game after game across the country. We also learned that there is an optimal size for classrooms (or anything else) based on inverted U-shape curves. Beyond a certain optimal size, the ratio of teachers to students exert little impact on academic success. Being a big fish in a small pond may also be better than being a small fish in a huge pond. To illustrate this, Gladwell narrates the story of Caroline Sacks. By choosing ivy-leagued Brown University over the University of Maryland, Sacks wilted in the high flying institution and dropped out of a science-based degree. This greatly limited her career options. Further studies revealed that the best performing PhDs of an average university achieve far better success in their academic careers than middling to lower performers at ivy-league universities. The next section The Theory of Desirable Difficulty focuses its attention on a couple of larger-than-life personalities. Gladwell convinces us that “thorns in the flesh” like dyslexia, deprived childhoods, and “disagreeable” neurotic personalities could drive people to take greater risks and be more entrepreneurial in what they do. Apparently, leading entrepreneurs and innovators like Ingvar Kamprad (founder of Ikea), Virgin’s Sir Richard Branson, and Emil “Jay” Freireich (who discovered major breakthroughs in curing childhood leukemia) belong to this category of misfits. The most memorable tale regaled how black preachers Martin Luther King Jr, Fred Shuttlesworth and Wyatt Walker employed the techniques of tricksters during the American civil rights movement. Through skillful maneuvers employing thousands of school children in the right place at the right time, the trio overcame overwhelming odds to win the fight for racial equality in the US. The rest, as they say, is history. The final part of the book, The Limits of Power, suggests that authorities taking iron-fisted approaches without considering the feelings of constituents often face failure. In the example of the long-running feud between the Protestants and Catholics in Northern Ireland, what could have been resolved in a couple of months ended up as a 30-year saga. The issue here was one of gaining moral legitimacy with one’s stakeholders – a point reiterated throughout the three stories in this section. In the story of Wilma Derksen, we learn that a grieving father’s movement to impose heftier punishments for repeat offenders in California fail to achieve improved outcomes. On the contrary, it increased crime in the state over the long term. A better approach, exemplified by Wilma Derksen who found the strength to forgive her daughter’s murderer, would be to walk away from the idea of revenge. Admittedly, Gladwell’s ideas, while compelling, are more anecdotal than evidential. Critics have pointed out that his narratives are one-sided and coloured to favour a certain version of the story. In the case of David and Goliath, for instance, Biblical scholars have contested Gladwell’s assertion that Goliath might have been a short-sighted sufferer of acromegaly. Despite its shortcomings, “David and Goliath“ is still a fun read. It provides us with unique life strategies when faced with seemingly insurmountable odds. Highly recommended.